The Savvy Sprout management and design teams exceeded our expectations! They delivered exceptional work at a reasonable budget with project completion on time – they were great! We are very grateful to them for their work – it has really boosted our business to a new level. The Careline Group is a Group of lifestyle companies – defining an aspirant, luxurious, quality lifestyle filled with beauty and joy. With offices in Cape Town, Luanda and Maputo, Careline offers a wonderful range of homeware, décor and beauty products. Over and above their product ranges, they are also the exclusive agents for @home in Angola and Carrol Boyes in Angola as well as Mozambique. 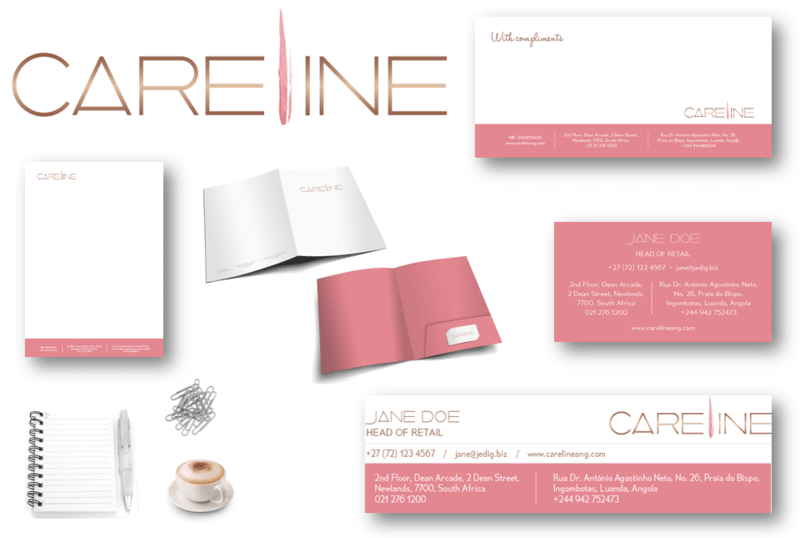 The Careline group previously had a logo in place, but felt that it did not encompass the vision that they had for their brand moving forward. “We aimed at re-branding – updating our previous logo, as well as all stationery and the website afterwards – a full corporate re-brand,” says Head of Commercial at Careline, Caroline Hossack. Being in a competitive market where a brand can make or break a business, they knew exactly what they wanted and required the creative facilitation to put their vision into practice and to become a reality. Hossack continues by saying, “the Savvy Sprout management and design teams exceeded our expectations! They delivered exceptional work at a reasonable budget with project completion on time – they were great! We are very grateful to them for their work – it has really boosted our business to a new level.” When Careline embarked on this re-branding project they were aware that they were not the experts in the field but had a very good idea what they were looking for. They needed a branding partner that could understand their needs and translate specified requirements into works of art. “They handled our re-branding project with professionalism, expertise and competence. They were dedicated and reliable throughout,” says Jenny Nurse-Sturrock, Head of Retail at Careline. Besides having a partner that understood their needs, they also needed to partner with a branding company that was able to give them accurate, knowledgeable and sound advice. They also needed some guidance to get the best possible range of branding elements together that would create the best possible platform for future growth. “The team at Savvy Sprout were able to do just that – they helped us every step of the way – with wisdom, knowledge and guidance throughout the project to ensure that we remained on track of both our needs and the brand requirements. The team at Savvy Sprout really helped us enhance our business and move it forward – we would absolutely, definitely recommend them – their service was 100%!” concludes Hossack.